Northern Beaches Council is planning new netball and multi-use courts in the Warriewood Valley, with the plans adopted last night for community feedback. 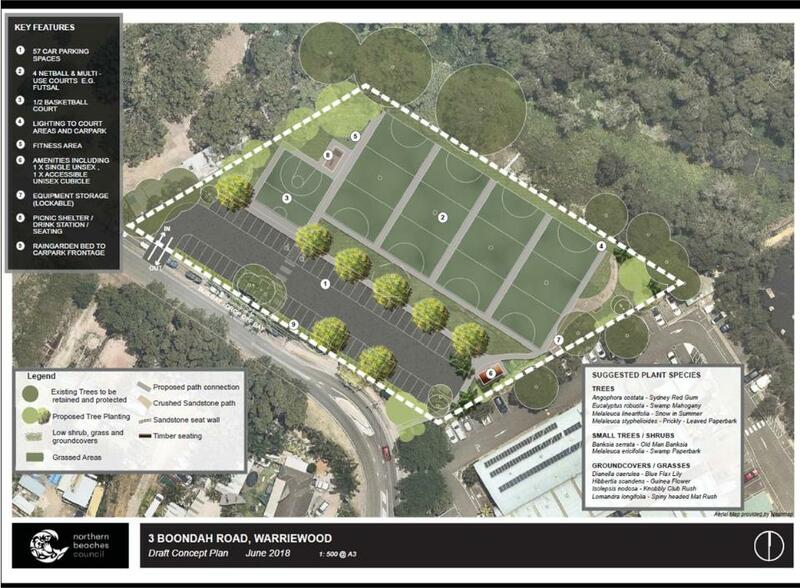 Council recently purchased 3 Boondah Road Warriewood and a draft Plan of Management and concept for the site has been developed, which includes four hard-court netball courts, a multi-use court, a 57 space carpark and a public amenities building. The proposed plan also retains significant trees on the site, establishes a wildlife corridor link at the rear of the park and provides for additional landscaping and water sustainable urban design features. Northern Beaches Mayor Michael Regan said the plan was in response to increased demand for more sporting facilities flagged in Council’s Sportsground Strategy in 2017. “The Warriewood Valley needs more sporting facilities and Northern Beaches Council is getting on with the job of delivering for the community. “More lit hard-surface netball courts was identified to provide suitable playing surfaces for all grades. “Other sports options were also investigated. As a result, a small basketball court is proposed and the netball courts will be available for other activities and informal games. “These facilities will cater to the needs of the growing community in the Warriewood Valley now and in the future. The property at 3 Boondah Road Warriewood was purchased by Council in 2017 with the intention of using the land for sports activities and general recreation. To date, Council has been clearing the land in preparation for potential development of the site once the community consultation process is complete. The Plan of Management and concept plan will be on public exhibition from 30 June to 5 August 2018. If approved the draft plan will be implemented in 2019. A Draft Plan of Management and concept plan has been developed and is on exhibition. The Plan of Management provides a framework for managing the site, including how the site is used, maintained and enhanced in the future.